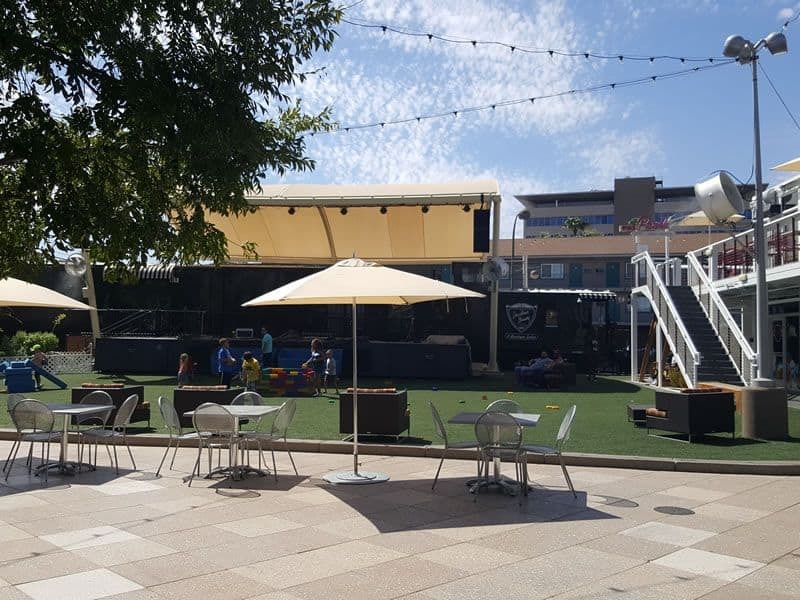 The Container Park is a whole new take on the open-air shopping and entertainment centers popping up around the country. 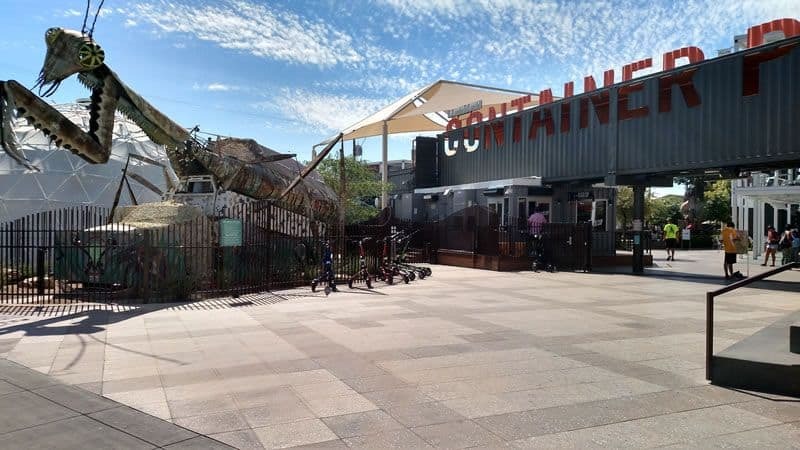 They have constructed the mall out of re-purposed shipping containers to house the boutiques, walkways, and restaurants. 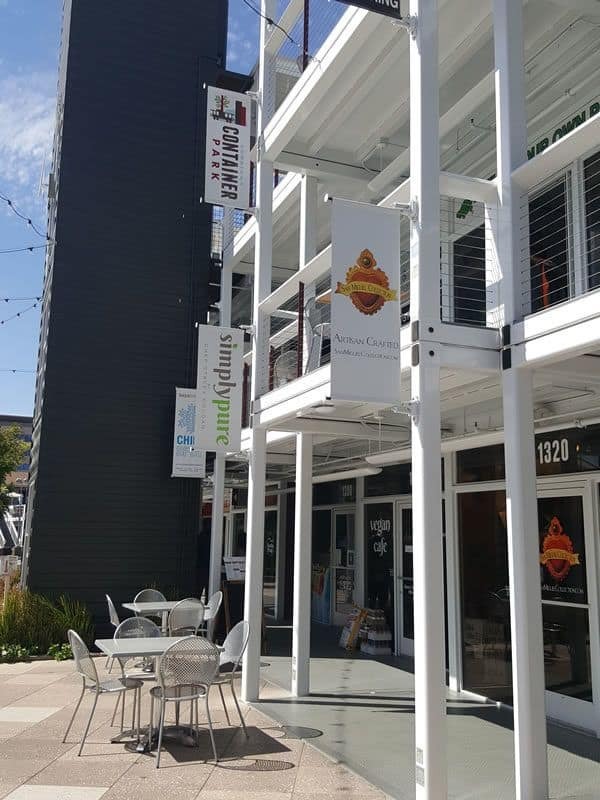 It sits in downtown Las Vegas, which is starting to see a Renaissance of locally sourced food and reclaimed materials to take what is old and make it fresh and useful again! 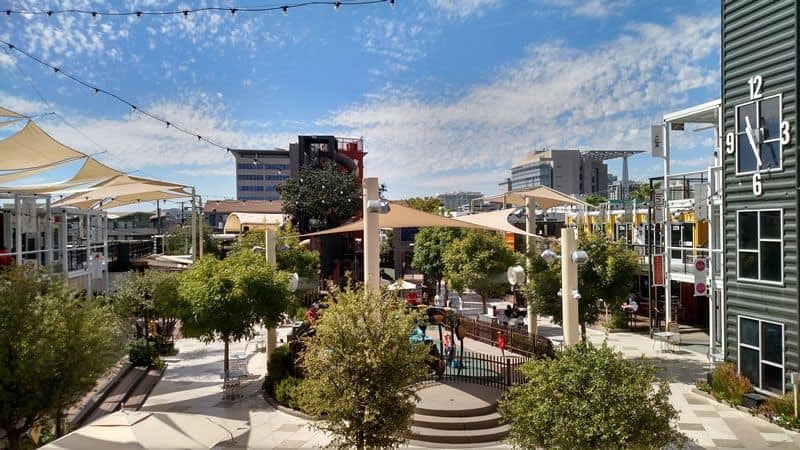 Come check out how the Container Park is changing everything we know and expect from shopping malls. You can immediately tell this Vegas shopping mall is different than the rest of the fancy, high-end malls on the Strip. You can see the rows of shipping containers that outline the outdoor shopping area. And, you can’t miss the giant insect at the entrance! The 55′ tall, 40′ long praying mantis sculpture outside the Container Park draws a crowd every night from sundown to close with his fire-shooting antennae that is synced to music. This unique metal creation was made by husband and wife Kirk Jellum and Kristen Ulmer in Rockville, Utah. They placed it on top of a 1983 GMC dump truck to make it mobile, which makes it one of the most unique street-legal attractions in Vegas! 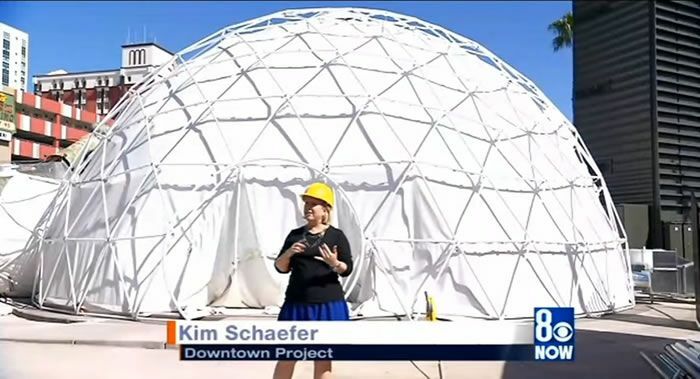 The Dome sits next to the Praying Mantis outside the Container Park, and was the brain child of Zappos founder, Tony Hseih, to draw families with children downtown. While the one in Las Vegas lights up and changes colors, it has the ability to do even more including show movies, play interactive video games, and display planetarium-like shows. 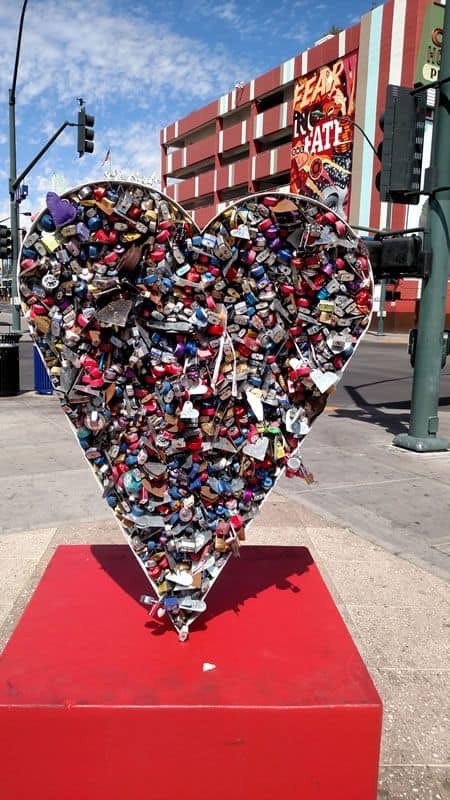 The heart shaped Love Lock sculpture in front of the Container Park is a representation of the city’s thoughts and prayers. 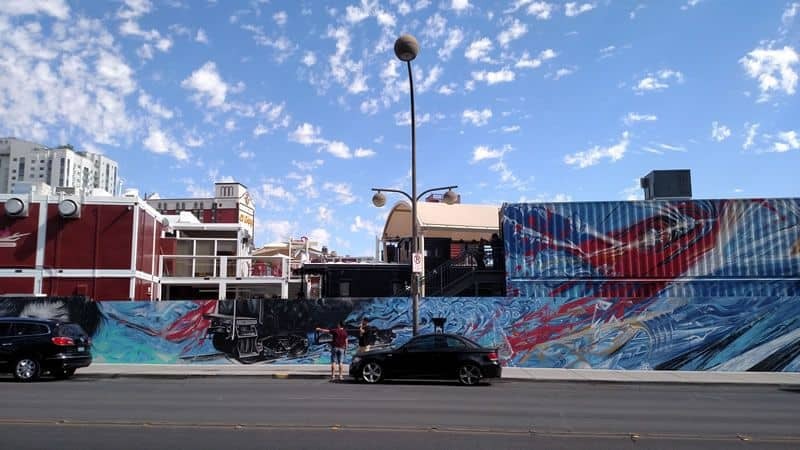 It was created by local artist Nova May for the Life is Beautiful festival. Visitors bought locks with metal hearts and wrote messages on each and attached it to the sculpture. 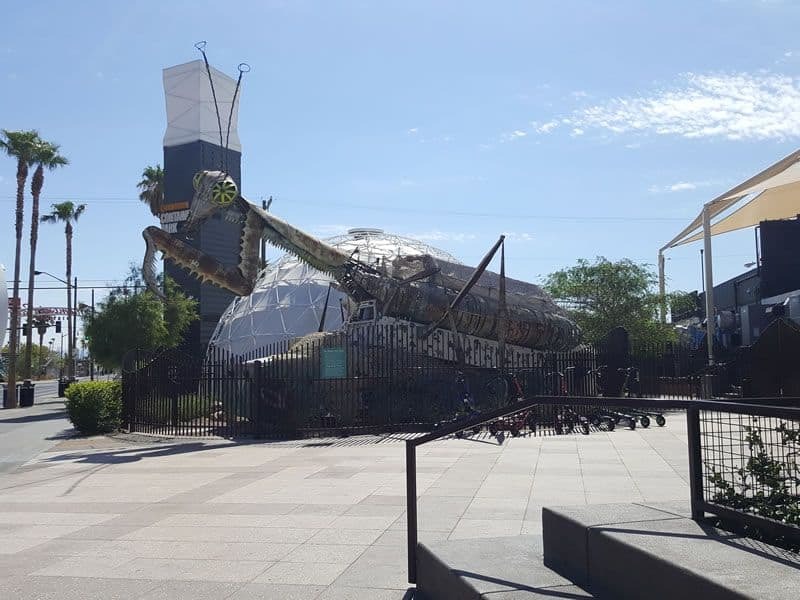 It is an organic piece of art in the center of downtown Las Vegas. The Love Lock was stolen back in January 2016, and an empty grate heart was promptly replaced, as visitors began filling it up again. It is a piece of art that everyone who visits can contribute to. As you walk in you notice the giant clock tower on the right and the three levels of stores. These are not your typical Las Vegas high-end brand stores like you’ll find on the Strip, nor are they the average strip mall fare with the large anchor stores like Best Buy and Bed, Bath & Beyond. 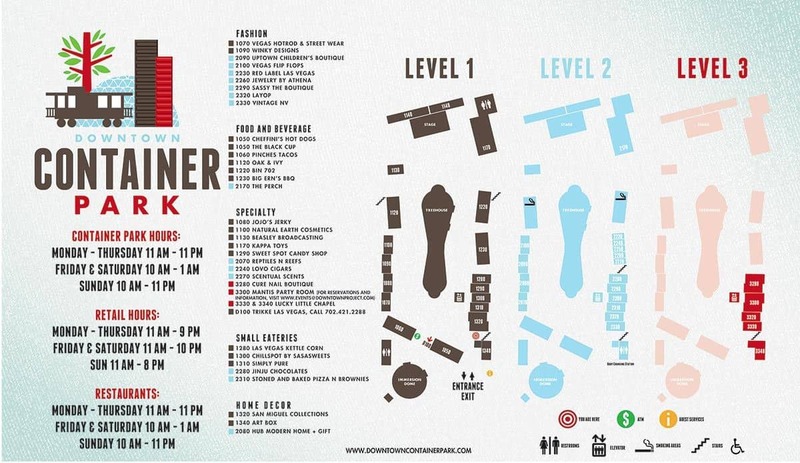 Instead, the shops at the Container Park are locally owned boutiques with an organic, hand-crafted flair! The three-level mall contains boutique shops in a variety of categories like apparel, art, jewelry, toys, and pet supplies. Live At Your Own Pace Clothing Co.
For a complete directory of shops, click the map below for a larger version. 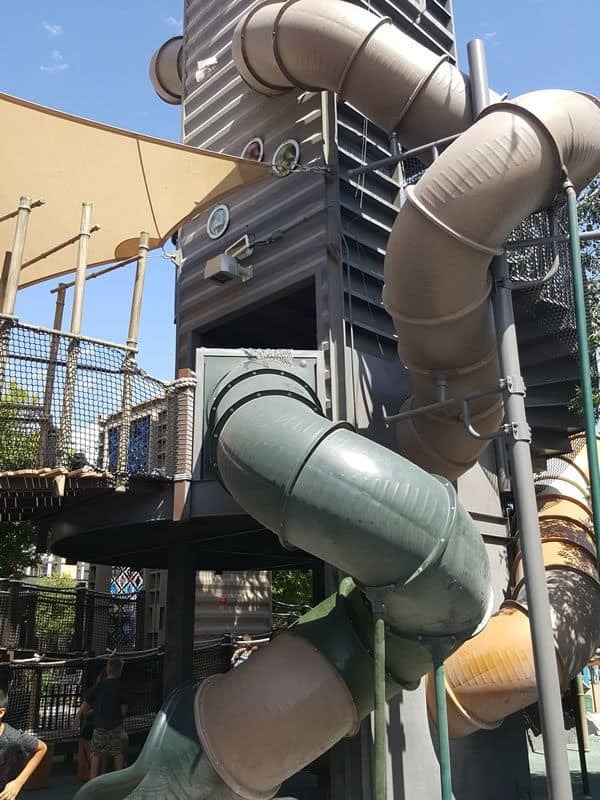 In the center of the Container Park is the Treehouse, and interactive playground for kids and adults, which includes a 33′ slide, a NEOS play system, and lots of room to be a kid! NEOS is the world’s first electronic play systems for the playground. NEOS combines the speed and reflex action of video games with the explosive movement of aerobic exercise to create the most physically challenging and exciting activity ever to hit your play space. Each NEOS play system offers multiple, high-thrill games for solo or team players. Every game presents a different set of challenges as players race each other – or the clock – to hit the blinking lights. 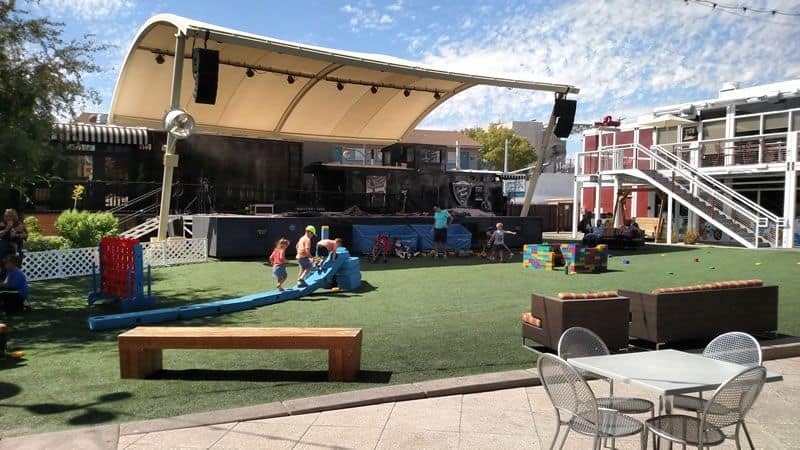 The grassed area is a great place for kids to run, play, and build with the blocks. It sits in front of the event stage (which provides some much needed shade in the summer months). There are several restaurants and small eateries to take a break and grab a bite. If you are looking for something quick, grab a hot dog at Cheffini’s, stop by the Chillspot for a shave ice, or grab a bag of kettle corn or jerky. For a sit down experience, Big Ern’s has amazing bbq specialties, The Perch has seasonal plates and salads, and for a vegan lunch or dinner, Simply Pure is sure to please. 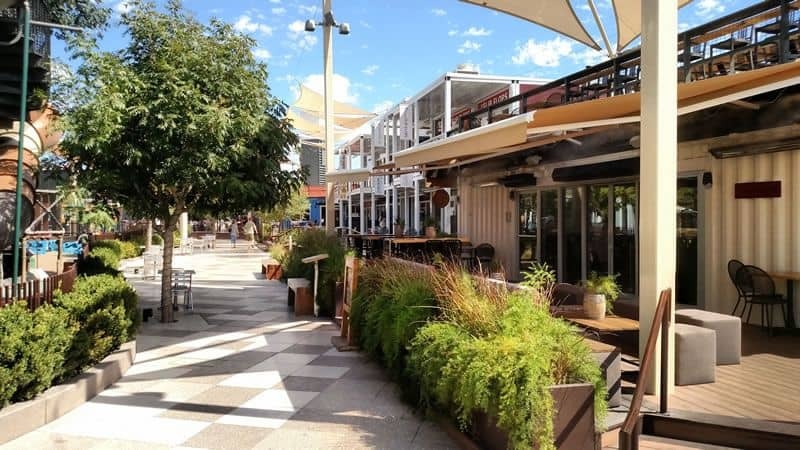 Bin 702 serves artisanal cheeses and every kind of grilled cheese sandwiches imaginable. The Oak & Ivy is one of the best rated bars in downtown Las Vegas, which features barrel-aged craft whiskey! The Black Cup Coffee Co. There are several tables around the play areas so you can get a drink and a bite and watch the kids play. No outside food or beverages. Strollers are not permitted in the Tree House Play Area for safety. Pets not permitted (except llamas and service animals). Juveniles under 18 not permitted without legal guardian. Juveniles under the age of 18 are welcome until 9:00 pm with a valid high school ID. Adults 21+ only after 9 pm. Any person disrupting the harmony or operations of the park will be removed. No firearms, knives or weapons of any kind are allowed in the park. 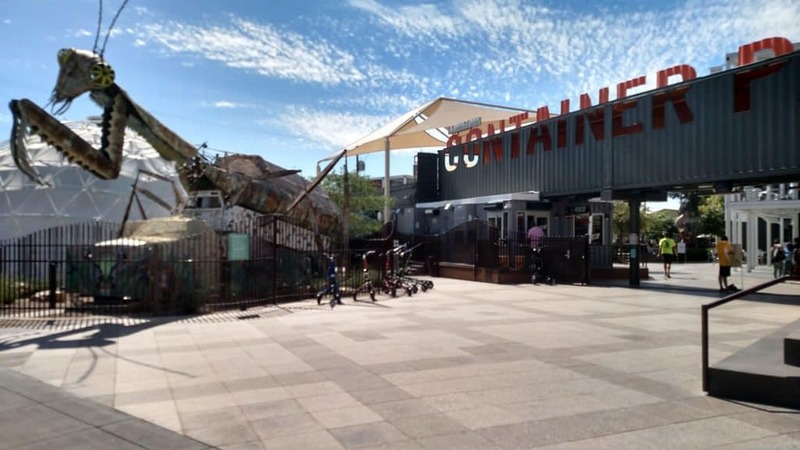 Minors unaccompanied by adults may be allowed to enter the Container Park with a valid high school or government issued identification for high school age minors. Monday-Sunday: 11 a.m. to 9 p.m.
Sunday: 11 a.m. to 8 p.m.
Monday-Thursday: 11 a.m. to 12 a.m.
Friday- Saturday: 10 a.m. to 2 a.m.
Make it easy and reserve your next parking spot with ParkMe – the Offical Las Vegas Parking App! Click Here for details. 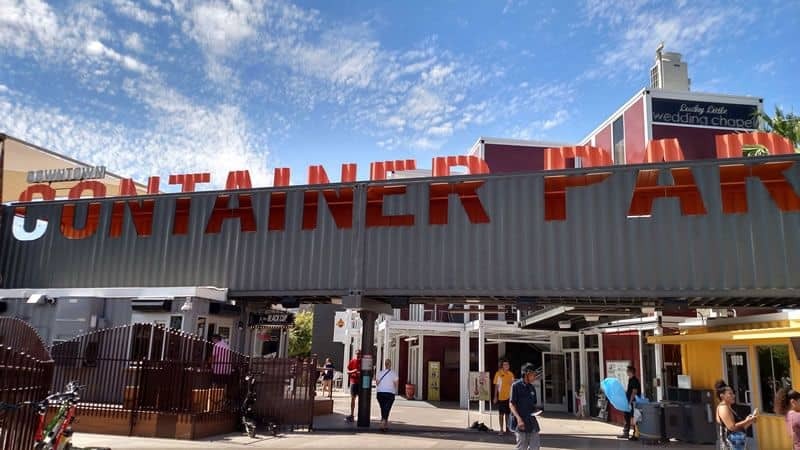 The Downtown Container Park is located at 707 Fremont Street, in the heart of Downtown Las Vegas at the corner of Fremont Street and S. 7th Street. Conveniently located near the I15 FWY and the 93/95 FWY, just minutes from Summerlin or Henderson. Fremont Street Experience on Las Vegas Blvd. Mob Museum on Stewart & 4th St.
Customers heading south along Las Vegas Blvd. can disembark at the Fremont Street Experience on Las Vegas Blvd. near Fremont St. 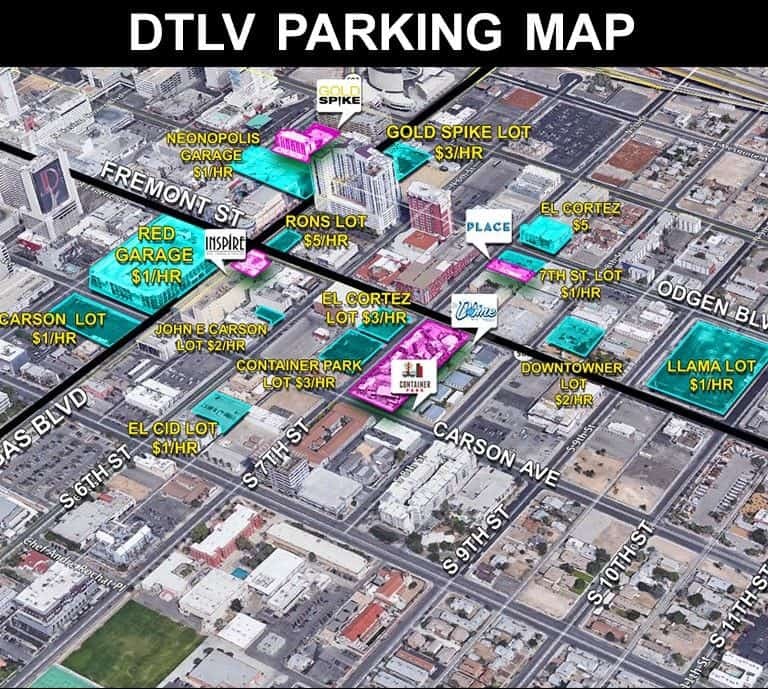 There is no on-site parking at Downtown Container Park. 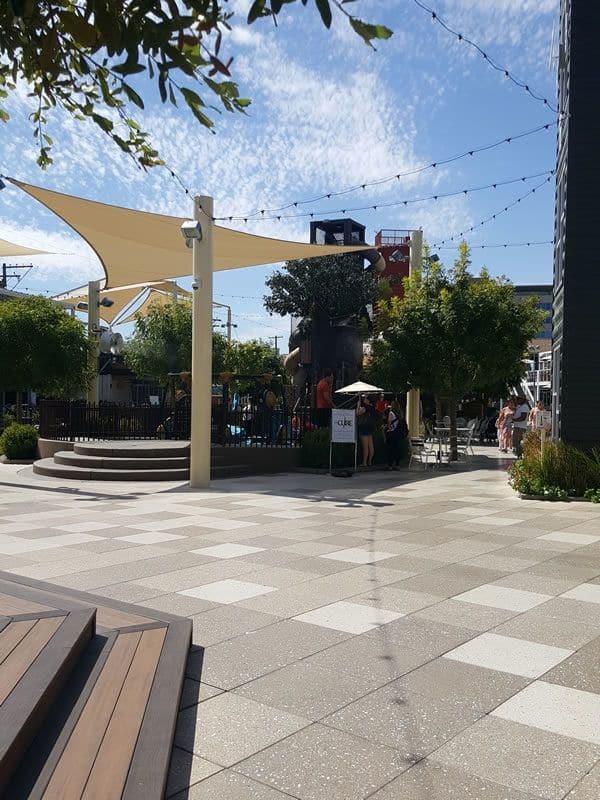 Individuals with disabilities may use the 10 minute loading zone in front of Downtown Container Park for pick-up and drop-off. We find the best places to eat, drink, stay, and things to do in Las Vegas both on the Strip and off.